A slew of options for Airtel's prepaid and postpaid customers alike comes at a time the telecom market is witnessing intense competition triggered by Reliance Jio. Some of the popular prepaid plans by Airtel are priced at Rs 199, Rs 349, Rs 399 and Rs 448. 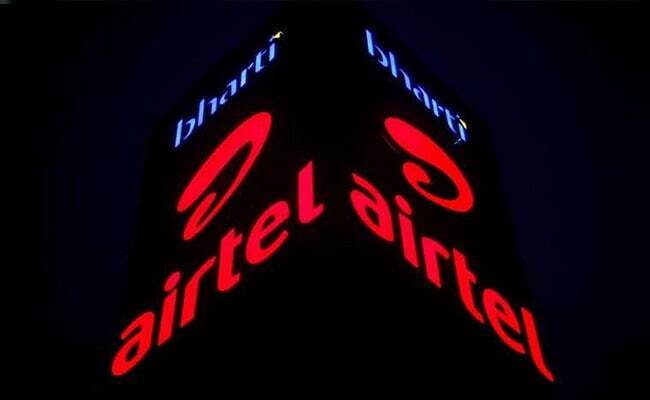 Bharti Airtel, the country's largest telecom company, provides many prepaid and postpaid plans to its customers. The slew of options for Airtel's prepaid and postpaid customers alike comes at a time the telecom market is witnessing intense competition triggered by Reliance Jio. Airtel, which is still the largest operator in the market in terms of subscribers, offers prepaid plans starting at Rs 8. Some of the popular prepaid plans by Airtel are priced at Rs 199, Rs 349, Rs 399 and Rs 448. Airtel has also launched a new postpaid plan, called Infinity, to garner maximum users in the postpaid bracket. Here is what Airtel offers in some of its popular plans. 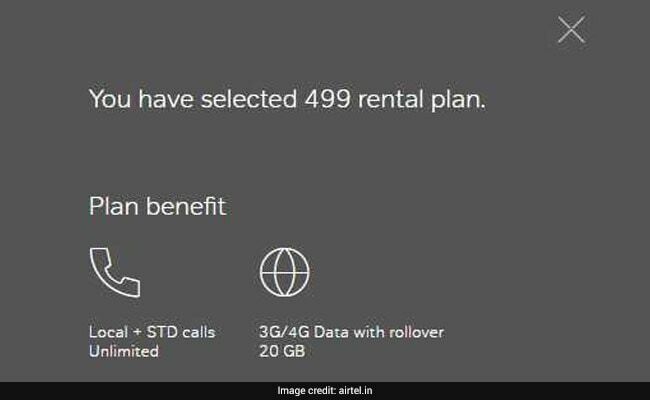 Airtel provides 1 GB data at Rs. 199. The Rs. 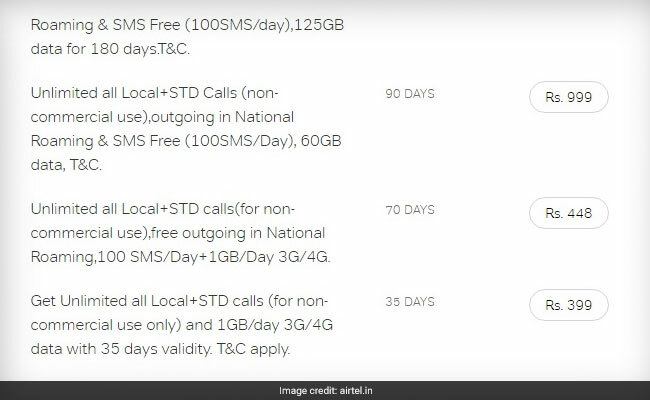 199 recharge plan from Airtel includes unlimited local and STD calls (for non-commercial use) and 100 free SMS per day, according to the Airtel website. Airtel said the Rs. 199 offer is "for non-commercial use only". Airtel's Rs. 349 plan offers subscribers unlimited local, STD and roaming calls along with 1.5 GB data per day for a validity period of 28 days. Airtel's Rs. 349 recharge also comes with 100 SMS per day for the validity period 28 days, according to Airtel's website - airtel.in. Under its recharge pack priced at Rs. 399, Airtel offers 1 GB data per day at 4G speed as well as unlimited local/STD calls along with roaming on outgoing calls. Airtel's Rs. 399 recharge plan comes with a validity period of 35 days. 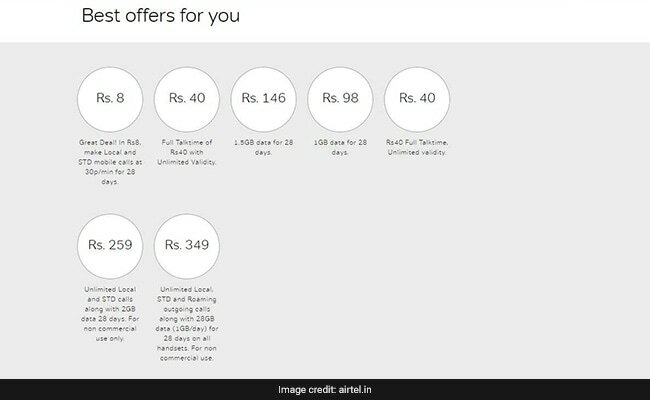 Airtel's special recharge plan priced at Rs. 448 comes with 1 GB of data per day at 3G/4G speed. The Rs. 448 pack also includes unlimited local and STD calls and free national roaming, besides 100 SMS per day. This plan comes with a validity period of 70 days. Customers who subscribe to Airtel Infinity postpaid plan get 20 GB 4G/3G data at Rs. 499 per month, Airtel said in a press release dated November 8. This plan also comes with a data rollover feature, which allows the subscriber to carry forward the unused data to the next billing cycle, subject to a maximum limit of 200 GBs.